Right, so Dark Eldar have been given a pretty amazing facelift of late, and come with a few new twists in terms of weaponry. They have plenty of lance weapons (which count armour over 12 as just 12) and also have access to melta weapons – in particular a melta lance weapon! So, as I said, lance weapons count armour over 12 as 12, but another way of looking at this is to say that a penetration result of 12 will glance any armour, and a penetration result of 13+ will pen any armour. So for our comparison we can treat a 13 result as being the same as a 14 or 15 (or 1,000,000 for that matter). I’ve plotted this using my usual format, and I’ve included Lances with Str 8 (Dark/Bright lance), S9 (Void Lance), and S10 (Orbital Lance Strike). As a baseline I’ve put in Krak missiles, and a Lascannon. Last, but by no means least, I’ve also included the S6 Lance Melta combo (aka Heat Lance). So lance weapons have a peculiar shape in that once they hit 13 then they basically flatline keeping the same odds ad infinitum. As I noted above this is because all armour over 12 is just 12 to a lance, so once you hit 13 you’ve got the pen on anything. 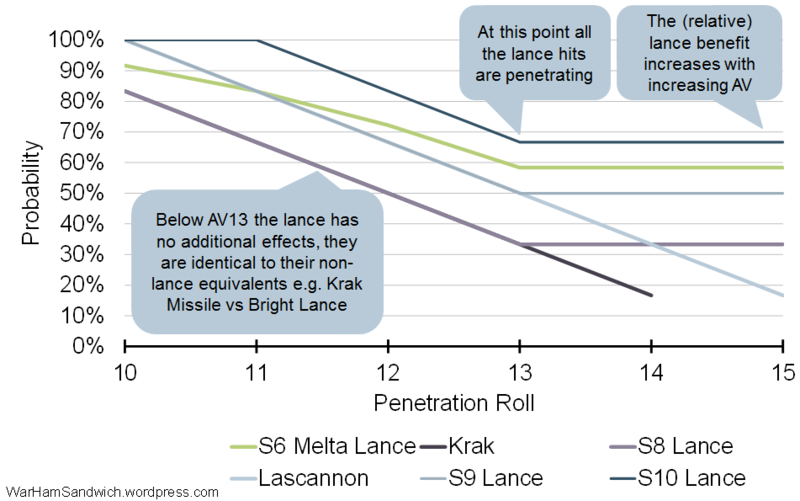 In terms of comparison with Krak and Lascannon, you can see that the S8 lance follows the Krak until they hit 13 and then the krak gets progressively worse while the lance keeps the same value (similarly for the S9 lance vs the lascannon). A more interesting comparison is the S8 lance vs the lascannon; the lance is consistently worse until we’re looking to penetrate AV13. Reading the chart you can see the lascannon has a 33% chance to pen AV14, the same as the S8 Lance (there’s a bit of a flaw in how I represent the lances in the chart, as once you reach 13 they are always penetrating whereas a 13 from a lascannon would only glance AV13. Rest assured I’ll find a better way of presenting this type of data in the future). For AV14 the S8 lance stays at 33%, while the lascannon sinks to 17%. So to sum it up, lances only get interesting against AV13 and AV14. 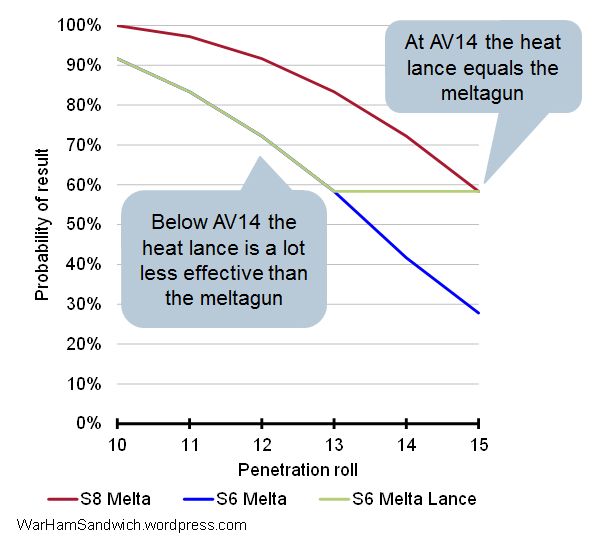 The S10 Lance is particularly lethal against AV13/14 witha 67% chance of pen, the S6 Melta (at close range) is also pretty savage with 58% chance of pen, which is about the same as a standard S8 meltagun against AV14. Next in line is S9 Lance, and then S8 Lance which is as good against AV14 as a regular S10 weapon. I’m focusing on AV14 here, but don’t be misled – that’s the ‘best case’ scenario for lance weapons. The higher the AV above 12 the more benefit the lance brings. So while a S8 lance is as good as S10 against AV14, S10 is better against AV13 and below (significantly so for AV12 and less). This effect is particularly well illustrated by a comparison of a S8 meltagun, a S6 meltagun, and a S6 lance meltagun. The benefit of the lance is clearly shown when the green line goes horizontal, but you can see that that it only catches up with the regular meltagun (red line) at AV14, it’s noticeably worse at everything else (and won’t instant death T4 models!). Ok so, summary. Lance weapons are only beneficial against AV13 and 14, moreso for AV14. Any (non lance) weapon that equals their effectiveness at AV14 will be better than them at everything below. Weapons that are weaker against AV14 could well be superior against lower AVs (e.g. a lascannon is worse than a brightlance at AV14, is equal at AV13, and better at everything below). Final verdict – it’s very meta sensitive. In a world of razorback spam, lance weapons do you no particular favours. But if your usual group is running triple Land Raiders then you’re golden. This entry was posted on Wednesday, September 14th, 2011 at 10:28 am	and posted in Probability. You can follow any responses to this entry through the RSS 2.0 feed. Focusing on the Lance rule with darklight weapons is a bit of a mistake- it’s best to think of them as Missile Launchers with slightly better AP, because that’s effectively what they are. Because of this, DE aren’t great at killing specific targets in a pinch with their Lances, because they don’t get that all-important double penetrating and +1 on the damage chart like Meltaguns do. For that reason, I find a few Heat Lances almost mandatory for taking out priority targets.Sometimes you HAVE to get that transport wrecked to take back an objective, etc, and Melta stats are perfect for that. I don’t think we’re in disagreement here. My aim was to simply describe the probabilities involved; I’m not suggesting that the Dark Eldar have a bunch of demolisher cannons and multimeltas available that they should be taking instead! As you noted, the +1 damage effect is quite useful, and does deserve attention. My plan for my next post on armour penetration is to extend the calculations to look at the overall odds of getting a destroyed result rather than just the odds of penetrating. Thanks for the comment, hope you keep reading the blog!